ISRO/DoS has been participating in the Smart India Hackathon (SIH), Software Edition, a 36 hour non-stop digital programming competition, being organised by MHRD since 2017. 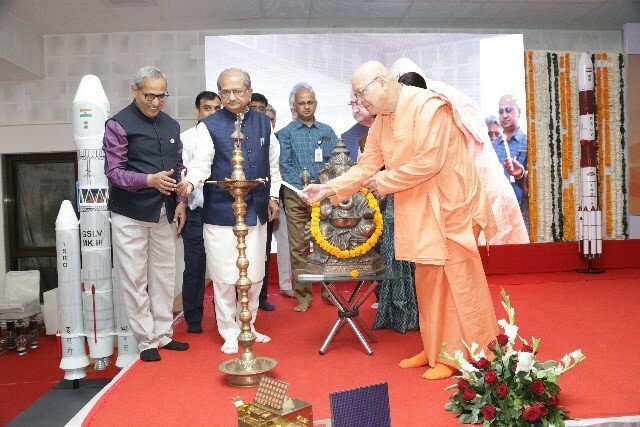 Its 3rd edition, SIH 2019, was held at Shri Sivananda Ashram, Ahmedabad during March 2 & 3, 2019. ISRO/DOS has been ‘Premier Partner’ in this initiative of All India Council for Technical Education (AICTE) under the aegis of Ministry of Human Resource Development. SIH is a nationwide initiative to provide students a platform to solve some of the pressing problems we face and thus inculcate a culture of product innovation and a mindset of problem solving. The Grand Finale was a 36 hours of non-stop digital programming competition held simultaneously at 48 Nodal Centers across India for different ministries and industries. The ISRO/DOS event was inaugurated by the chief guests Hon’ble Education Minister of Gujarat Shri Bhupendrasinh Chudasama, Dr. PG Diwakar ISRO Head Quarters, Vice Chancellor, Gujarat Technological University (GTU) Dr. Navin Sheth, and H. H. Swami, Shri Adhyatmanand ji Maharaj of Shivananda Ashram at 7:40 AM on March 2, 2019. Nationwide Inaugural function was addressed by eminent organising personalities through video mode. Dr. Anand Deshpande, Chairman MD Persistent Systems, Prof. Anil Sahasrabudhe Chairman AICTE and Honorable Minister of Human Resource Development Shri Prakash Javedekar inaugurated the Grand Finale of SIH-2019 at 8:30 AM and formally announced to start the competition. ISRO/DoS has proved the significance of Space science and technology for the benefit of society. At ISRO, there are ample challenges and unlimited opportunities to students to showcase their expertise and providing innovative solutions using satellite data and space technologies which in turn will help to improve the quality of life of Indian citizens. This year, ISRO/DOS has selected “SMART COMMUNICATION” as the theme for SIH-2019 to get novel ideas from India’s young and ignited minds to resolve specific issues in their own innovative ways. This year, the problem statements were categorised by MHRD under three different categories based on the difficulty level, namely, Simple, Complex and complicated with winning award of Rs.50,000, Rs. 75,000 and Rs.100,000 respectively. Seven problem statements were worked out by a technical team of ISRO/DOS experts under the chairmanship of Shri Atul Shukla to trigger the engineering minds for innovative solutions covering the fields of Satellite Communications, Satellite Remote Sensing, Satellite Navigation Applications, etc. Out of these seven problems, four were of complex category and three were in complicated category. Four problems were related to Satellite Navigation Applications, two problems were based on Satellite Communication and one was based on Satellite remote sensing. The problem statements were posted by ISRO/DOS at SIH portal and received solutions. After evaluating some 242 ideas from 190 different colleges, ISRO/DOS team short listed 28 teams for participating in the grand finale. Multiple online mentoring sessions were organised by ISRO in February 2019 in which student teams have actively participated to clarify their doubts and get expert advice. SIH Organisers confirmed participation by 29 teams (28 + 1 wild card entry). 27 teams consisting of 180 students from 12 different states have participated in the Grand Finale. Honb’le Prime Minister of India, Shri Narendra Modi, addressed all the participants across the country at 10 PM on 2nd March, and interacted with some of the participants from different nodal centers via Live Video Conference. He congratulated the young minds for participating in solving the challenging problems and encouraged them to stand up for the country. During 36 hours of competition, for each problem, there were several mentoring and evaluation rounds by the ISRO identified 7 panels of judges/experts. Each panel had 5 jury members/experts from ISRO/DOS headed by a chief Judge. Evaluation process was defined by SIH-2019 national organisers and quality aspects were of ISRO/DOS standards. Six teams have won the awards of 6 problem statements while 1 problem statement could not be cracked upto the required standard by any team. The Valedictory function started at 8:30 PM of March 3, 2019 in the presence of Shri DK Das Director, SAC and Shri NM Desai Associate Director, SAC. The winners were announced by Dr. Haresh Bhatt, Chief Judge and were awarded during the Valedictory function with cash prizes and trophies designed indigenously at SAC. Apart from the awards, all the participating teams got certificates and Mementos from ISRO/DOS. The event was organised by a Local Organizing Committee under the Chairmanship of Shri Rajesh Khandelwal. Local Print and Electronic media gave a good coverage to the event. As post Hackathon activity, few teams are likely to be given opportunity to develop full-fledged software under the mentorship of ISRO/DOS experts through RESPOND kind of mechanism.